From time to time an event or some other type situation occurs where Adam T. Holland, President of Holland Entertainment LLC. Returns to his roots as a journalist and will opine a column with his views. This page is dedicated to those times. Adam Holland is the president of Holland Entertainment LLC which operates the Fiske Theatre in Oak Grove, La. for the West Carroll Chamber of Commerce. Opinions included in this column do not reflect those of Holland Entertainment, The Fiske Theatre, W.C. Chamber or this publication. Adam may be reached at 318-428-8289 or via email at adam@fisketheatre.com. Photo Caption: Austin Holland was welcomed home Friday, May 17th by the Members of the Catron-Kelly Post 53 of the American Legion at the Legion Hut in the City Park. Pictured Left to right: O.N. Hamilton Jr., David Allen, Vern Irvin, Sgt. Richard Austin Holland II, John White, Bobby Barnett, and Jimmy French. OAK GROVE, La. --- Oak Grove’s own Richard Austin Holland completed a 24-month tour of the Korean Peninsula where he was stationed in Dongucheon. While there he was promoted to the rank of Sergeant in the United States Army Second Infantry Division, 6th Battalion, 37th Field Artillery, Charlie Battery. “It is great to be back home and on American soil,” Sgt. Holland said. 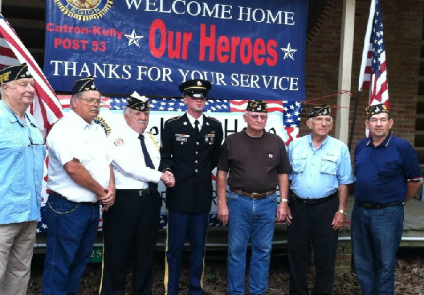 “I want to thank everyone and especially Catron-Kelly Post 53 of the American Legion for the warm welcome that they extended to me. It was truly an honor to be recognized by such a group of men who have gone above and beyond their call of duty. Korea is a very interesting and the experiences I received while there were invaluable in training me to be a better man and leader for my battalion, company and our community when I complete my term in the United States Armed forces. While serving in Korea his duties included manning the rocket launchers 15 miles from the Demilitarized Zone at the 38th Parallel. Sgt. Holland is the son of Ricky and Sharri Holland, the grandson of the late Jimmy Miles Holland and Carolyn Holland of Oak Grove and Karen Johnson, also of Oak Grove. He has one sister Kristina Holland. He is also the nephew of Councilman Jimmy T. Holland and Janice of Oak Grove and first cousin of Oak Grove Businessman Adam T. Holland. Holland is the second generation of the family who has served in Korea. His grandfather the late Jimmy Miles Holland served on the peninsula during the Korean conflict in the 1950’s as a corporal. Holland will be home for 30 days before being stationed in Fort Sill, Okla. In the 214th Fires Brigade. Well, award season 2013 has now officially come to a close. After watching the precursors (Golden Globes and SAGs), OSCAR night 2013 was anti-climatic to say the least. Generally when writing a piece such as this I would start with the least importance and work my way to the top but in this case let’s start with the biggies and work our way down. No shocker here, Best Picture: Argo. The thriller concerning the Iran Hostage affair was odds on favorite for this award going in after receiving the equivalent awards in the previous two shows. Best Actor: Dainel Day-Lewis. Couldn’t have gone to a more deserving actor, if you didn’t see his portrayal of President Abraham Lincoln in Lincoln you missed a treat. He nailed this part down to the way the 16th President walked and talked. Best Actress: Jennifer Lawrence for Silver Linings Playbook, I didn’t see this picture, but everything I have heard it was an excellent and most definitely inspirational film about overcoming adversity. The award for Best Directing went to Ang Lee for Life of Pi. The colors, cinematography and everything involved with this heartwarming tale was superb. The Academy hit the nail on the head with their pick in this category. Best Original Screenplay went to Quentin Tarantino for Django Unchained. After seeing this film, I think I would have to disagree with this choice. Though the story was definitely original, the way it was played out on the screen with overly graphic violence and the over use of the F-Bomb definitely would have taken it out of award contingence for me. Production Design went to the definitely deserving Lincoln, and Best Film Editing to Argo. Anne Hathaway took home the little gold man for Best Supporting Actress for her role as the ill-fated Fantine in Les Miserable’s. If you didn’t see this picture the pain she had to have gone through to portray this character was definitely award worthy. Though the picture didn’t do it for me as I am not a fan of a movie where 90% of the lines are sung, the entire cast of this picture deserved recognition for their work. Sound Editing was a tie between Zero Dark Thirty and Skyfall. Both were great movies with great sound, but in my humble opinion I would have to give Skyfall the edge as it was mixed in the new 7.1 format where Zero Dark Thirty was mixed in the traditional 5.1. Skipping a few that don’t pertain to the vast majority of readers of this column let’s move on to Makeup and Hairstyling. This award went to none other than Les Miserable’s. Once again the costuming and makeup required for this film was superb. Visual Effects went to Life of Pi, as I said earlier everything about the production of this film was the best I have seen. To compliment Visual Effects, Life of Pi also brought home the statue for Cinematography. In the animated categories both of my picks brought home the awards. Animated Feature Film Brave and Animated Short Paper Man. And rounding out the awards Best Supporting Actor went to Christoph Waltz for his role as Dr. King Schultz, a dentist-turned-bounty hunter in Django Unchained. 2012 was definitively a banner year in film in terms of quality. Let’s all hope things turn around in 2013 and Hollywood begins to turn out much better product than they have the last two months. I, for one, have been very disappointed with their offerings so far this year and so far from what I have heard and seen from the box office results so have you. Adam Holland is the President of Holland Entertainment LLC, which operates the Fiske Theatre in Oak Grove, La. for the West Carroll Chamber of Commerce. Opinions represented herein are those of its author and do not necessarily represent those of the West Carroll Chamber, The Fiske Theatre or this publication. You can contact him by emailing fisketheatre@hotmail.com. BASTROP, La. --- The smell of hot popcorn cooked in coconut oil and the light bouncing off the silver screen, nothing is more American than the grand tradition of seeing a movie in a true single-screen movie palace, well except for baseball and apple pie of course. That tradition is set to return this spring to the city of Bastrop, La. as the Rose Theatre is set to become the second single-screen theater in Northeast Louisiana to return to her roots in motion picture exhibition. If the Fiske in Oak Grove is the “Grand Dame of Northeast Louisiana Movie Theaters,” the Rose has to be the “Great Grand.” Built in 1927 by the Goodwin family of Bastrop, in her prime the Rose was the premier place to catch the latest flick in the region. Beginning in March, the Cotton Country Players, who now own and operate the Rose as a Non-Profit 501-C3 organization, look to recapture that magic by becoming the only theatre in the region to offer classics, retro and arts flare films. This charge is not something they are taking lightly either. The Cotton Country Players have pulled no punches in their return to motion picture exhibition, bringing in one of the industry’s most respected showmen in the region Adam Holland, President of Holland Entertainment LLC of Oak Grove which operates the Fiske for the West Carroll Chamber, to help guide them in this new venture. Holland has been a part of motion picture exhibition since 2007, first as the volunteer chairman of the W.C. Chamber’s Fiske Theatre Committee, then the Director of the Fiske and in 2011 his family began operating the theatre as Holland Entertainment as studios forced exhibitors across the nation transition to digital projection. Over the past six-years he has been instrumental in bringing Fiske back to her prime as Northeast Louisiana’s most modern and well equipped movie theatre. Holland will serve as the lead consultant for the Cotton Country Players in the initial phases of this venture, as well as serving as their booking agent with the studios. The No.1 musical of all time “Grease” starring John Travolta and Olivia Newton John is slated to be the first picture to light up the screen at the Rose since the mid1970’s the weekend of March 15-17. Tentative movie scheduling for the first period of the Rose Film Series include Gone With The Wind; Dirty Dancing; The Good, The Bad and The Ugly; and Top Gun. Movies are scheduled to play the third weekend of each month. The Rose Theatre has many offerings on the horizon – Grease March 15-17; YOUtheatre performance March 8 - 10; Equinox Jazz at the Bastrop Historical Apartments April 6; and Dinner Theatre at the Visitor Center April 26-27. What better time to join the historically rich and increasing diverseness of the Rose as we continue to bloom for Morehouse Parish. Being an exhibitor of motion pictures awards season seems to becoming more intriguing to me than ever before, especially with the slate of movies that were released in 2012 that had broad appeal and are actually contenders at the award shows this year. As I watched the 2013 Screen Actors Guild awards Sunday night I was pleasantly surprised for the most part at how well pictures we have played or are going to play faired. This the second of the big award shows gives us ideas of what we can truly expect come OSCAR night in four weeks. Going into the show I was very optimistic after the strong showing our films had at the Golden Globes and in the motion picture categories for the most part I was not disappointed. The evening started well with Tommy Lee Jones winning outstanding supporting actor in a motion picture for his portrayal of Congressman Josiah Stephens in Lincoln. Being a history teacher by trade I have made no secret of the fact I am very partial to this picture. Up next was outstanding supporting actress in a motion picture and again another win for us at the Fiske, Anne Hathaway for performance in Les Miserable’s. The more I watch the trailer for this film and the more talk I hear from our loyal patrons; the more I am anticipating seeing it when it hits our screen February 15. Personally I am not a fan of the modern musicals but this picture looks as if it is truly a work of art. Outstanding Action Performance by a Stunt Ensemble in a Motion Picture went to another picture that was featured at our theatre Skyfall. If you missed this movie you missed a treat. Not being a child of the 1960’s and getting to see Shawn Connery’s portrayal of James Bond on the big screen I may not have the credentials to say this, but what I have seen and have been told Daniel Craig and the cast of this 007 picture equaled or not bettered some of the best performances of all the Bond Franchise. Now on to the three major awards of the evening. Outstanding Actress in a Leading Role went to Jennifer Lawrence for her portrayal of Tiffany in Silver Linings Playbook. I have not seen the picture, but now that it is award season, I have to admit I am kicking myself for not bringing it to our theatre as I have heard it was truly and amazing movie that had a little bit of it all, drama, comedy and romance all of which generally play well at the Fiske. Outstanding Actor in a Leading Role went to none other than who I truly believe was the best actor of the year, Daniel-Day Lewis for his portrayal of President Abraham Lincoln in Lincoln. In a previous column I went into detail about how great this actor performed in what had to have been a very challenging role; considering no one alive knows how the 16th President talked, walked or handled himself firsthand. Lewis had to have gone to great lengths to read and study-up on President Lincoln to have been able to portray him as convincingly had he did in this movie. The most coveted award of the evening and probably the best predictor of what will be the Best Picture of the Year come OSCAR night is Outstanding Ensemble in a Motion Picture, and just as with the Golden Globes this award went to the cast of Argo. Now with Argo taking home the best picture in the Golden Globes and now the biggest prize of the SAGS I am beginning to come to terms with the fact that the film I am most prejudice toward Lincoln is losing its momentum to win the best picture at the OSCARS. That being said, (And yes I know I was harsh toward this picture in my last column,) the more I see and hear of the film it truly may be deserving of the honor. In the case it does bring home the statue OSCAR night I will truly take a hard look at bringing it to Oak Grove mid-week sometime in March as we did with The Kings Speech a few years back. The OSCARS are now just four weeks away and now with the two precursors to Hollywood’s biggest night behind us we now have an idea what to expect. Once again I must say that 2012 was truly a great year in terms of motion pictures and as we look into the crystal ball for 2013 there is several pictures on the slate that have the potential to be great as well. Movie going is a tradition in America almost as much as Apple Pie and I encourage you to visit your local theatre as often as possible especially if you are blessed to live in a community such as our little spot in Northeast Louisiana where your Historic Theatre is still a part of the fabric of your community.